As a downright winter-weather fanatic, this time of year always excites me—especially if pre-season forecasts for very large amounts of snow covering very large mountains across the country is to be believed. As a beer-lover, however, I treat the season with a touch more ambivalence. The pumpkin spice trend always struck me as 99% marketing, 1% desire—and if you ask me, it has never tasted good. And just as most fall beers leave me yearning for something less autumnal, winter seasonal releases always seem high on concept, but poor in execution given my taste palate. Over-malted brews with holiday spices and crazy-boozy ABVs? I’d rather have a spicy saison. I do experiment each year with The Bruery’s annual holiday release themed around “The 12 Days of Christmas.” This winter’s 10 Lords-a-Leaping spins a traditional winter warmer into a dark imperial wit ale with a fistful of spices, which might be perfect. Or it might be a perfect example of the tastes that I personally find less than exciting. But now I’m adding two other seasonals to my exception list. Deschutes’ Jubelale and New Belgium’s Accumulation. Deschutes’ Jubelale describes itself like the stuff I typically don’t dig: a robust ale with a warming spice derived from a mix of malts and hops. But the beer’s bold flavors of dried fruit and toffee saves it from being overly cloying, less like drinking a fruit cake and more like something you’d toss back a few times. And an approachable 6.7% ABV should help stave off any holiday faux pas. This year celebrates the 30th bottling, so they’ve spruced up the joint a bit; Rather than simply doing a new winter-themed label (as they’ve done in the past) this year they’re doing a series of limited-edition snowflake-themed illustrations. And we all like snowflakes, right? 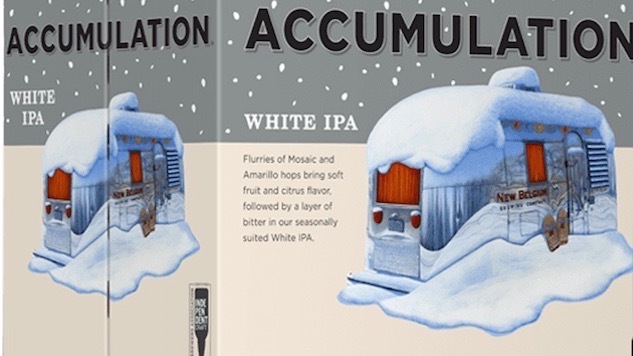 New Belgium’s winter seasonal, Accumulation, had me with its name—as in, please let the weather gods dump mountains of snow across the ski-friendly landscapes of our fair planet this winter. But the style also fits within my wheelhouse, a white IPA brewed to stand in opposition to the profusion of dark winter seasonals that flood the market come November. It comes with a hearty 55-IBU punch from Nugget and Centennial hops—along with dry-hopped Mosaic and Amarillo, with a touch of wheat to mellow things out. And the ABV stays respectable at 6.2%. It pairs nicely with Mexican fair like tacos or enchiladas, should you want to fight the cold with a culinary detour to warmer climes. Or go for a spicy chili carrot soup, which New Belgium says should nicely contrast with the hoppy sweetness of the beer. Either one will make fireside après this season just a little bit sweeter.